Sydnee Crain, 5-8, Girard, Sr. & Abby Ogle, Baldwin, 5-8, Sr.
Crain, a Pittsburg State signee, had a terrific season. Crain went over 1,000 points for her career in January totaling 1,339 in four years for the second most in school history. A three-sport all-state player, Crain averaged more than 23 points a contest this year to lead 4A-II in scoring. She helped Girard win titles in basketball and softball last year, the first two state titles in school annals. Crain served as a four-year starter at point guard with three trips to the state tourney, including a state title last year. She is a three-time all-state selection in 4A-II. Ogle led Baldwin to a state championship and averaged 17.4 points, 6.4 steals and 4.4 assists, all team bests. In the state semifinals, she tallied 28 points on 10 of 18 shooting in a 60-47 victory against Hugoton. In the final, she finished with 22 points on 9 of 16 shooting in a 58-57 win versus Andale. For her career, Ogle tallied 1,292 points for 13.6 points per game. Baldwin captured its first title since 1996. Ogle was also the Most Outstanding Player of the 2018 state tournament. Producers Co-Op Farm Store of Girard would like to congratulate the 2018 Sports in Kansas 4A-II Player of the Year, Sydnee Crain of Girard. Producers Co-Op Farm Store is a proud supporter of Girard High School Athletics. Farm Bureau Financial Services of Girard would like to congratulate Sydnee Crain on an outstanding high school basketball career and the 2018 SIK 4A-II Player of the Year. 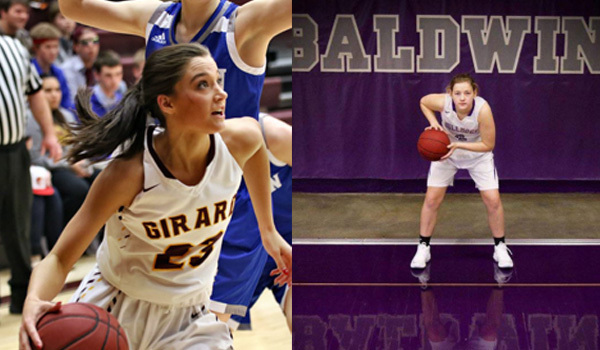 Wheat State Elite would like to congratulate their very own players, Sydnee Crain of Girard and Abby Ogle of Baldwin, on the 2018 4A-II Sports in Kansas Player of the Year. Wheat State Elite, Dylan and Chelsey Evans, would like to congratulate all high school basketball players on their seasons in 2018!